Local celebrity Dr Jessie Chung’s efforts to raise funds for needy cancer patients resulted in five full houses in Chinese orchestral concert. The organiser is extending it to a Malaysian Record breaking 10 consecutive performances. The concert will be held at Symphony Music Hall in Kuala Lumpur at 7.30pm on April 30, June 18 and 19, and at Kenyalang Theatre here at 7pm on June 11. Several of the concerts were almost instantly sold out. Each concert had special guests with various performances to add entertainment value. Two Malaysian young idol groups and a few local television, film and stage show actors guest are starring in the event. Chung and her Chinese Orchestral entourage fed the audience with many renowned oriental classical songs from different eras. She made her debut appearance as a beautiful divine angel to present theme songs of famous Chinese literature, Dream of Red Chamber’s Drawn Brows (Wang Ling Mei), Burying Flowers (Zang Hua) and theme song of award winning film ‘Curse of the Golden Flower’ by Jay Chou named ‘Ju Hua Tai’. She is the first Malaysian singer to deliver Malay and Japanese songs with Chinese orchestral backup. 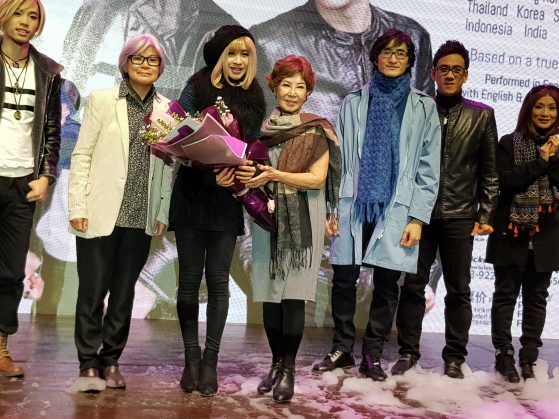 Chung posed as a princess of the Tang Dynasty to perform with stage show actors of ‘The Quatrain of Seven Steps’ namely Vernon Tee and Marcus Choot as well as film television stars of ‘Unchanging Love’ Tylor Chen and her son Jeffery Beh. Besides the singing, the audience was also treated to a short drama of Empress Wu Ze Tian. After a feast of Chinese oriental numbers, Chung set the audience on fire in a black-and-gold Wonder Woman outfit, delivering back-to-back unreleased English songs from her latest English album ‘There You Are’. She is to record her new English album in Australia in June and the album expected for release at yearend. All proceeds generated from the concerts will go to cancer funds. For more information, call 082-574108, 03-55693721 or 016-3366701.